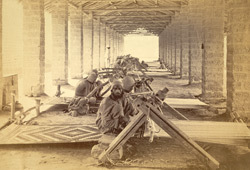 Photograph of carpet weavers in Karachi Jail in Sindh, Pakistan, taken by Michie and Company in c. 1873, from the Archaeological Survey of India Collections. This image of a line of carpet weavers seated at their looms in a shed was shown at the Vienna Exhibition of that year. In the 19th century a number of schemes for a carpet industry was developed in government jails in India partly in order to train convicts in a skill but also to provide a cheaper market for traditional patterns.